Finnish stoner/groove metal newcomers Black Blood apparently forged their sound playing uncounted Helsinki bars, with their new self-titled album being the first collection of songwriting ideas they had. Unpretentious and with a gritty ambience pulled straight from the bar scene they know, but sounding more like the venues they frequent ought to be located on the subtropical plains of Alabama rather than the cold swamps of Finland, Black Blood has a heavy, guitar-riff-driven sound heavy on the pinch harmonics. Jukka-Pekka Lappalainen's guitars have the big, larger-than-life sound that Zakk Wylde or Woody Weatherman impart to metal of this style, mixed such that it is blocky and uniform across the mix, with the distortion and the playing style dropping pinch harmonics throughout the songs. For such a fat sound, the guitar riffs are surprisingly quick and thrashy -- and they pound the listener most of the time. Sometimes, such as on Shrine of Vanity or Same Ol', the relentless riffing halts briefly for a sharp solo heavy on the midrange and highs, the sort of thing that Dimebag Darrell used to do on songs, but usually the guitars focus on groove-laden rhythms, and the vocals of frontman Heikki Rautava go along with them with a focused, gravelly sound without a tremendous amount of range. Running with Scissors combines a swinging, Southern-stoner-doom riff with a strong melody, but I also enjoyed Route 66.6, which has almost none of the abovementioned elements -- it's a quiet instrumental --, but which really distills the essence of their Western sound down into a quieter, more minimalist experience than the usual cliff-height wall of guitar noise. Even with all the Southern elements, I didn't get a sense that the band's sound is an homage to Southern stoner doom; more like it just kind of developed that way as a product of the band's influences. There's certainly a lot of stoner raucousness in the music, and Rautava's dirty growl underscores that with a sound of weary disgust, especially on Wolf of Anger, which has a slower tempo than some of the other pieces. But there are a number of tracks on the album, and what saves them from all sounding the same is the willingness of the band not just to confine themselves to a stoner sound, but to try to speed it up too. The last attempt of this sort, Speed Thrills & Roadkills, was one of my favorites: Two minutes of noisy thrashing, with Rautava adding some screams to his growling at the end of verses, still saves some time for a decent solo. 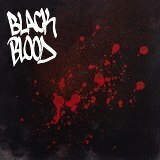 This is still sort of early to tell what Black Blood will develop into, but their debut is a promising start and shows a bar band that is beginning to develop into something more. Fans of doomy, Southern-style stoner metal along the lines of Keenan-era Corrosion of Conformity or Tombstone Highway might like this one.